If the server detects that your terminal number is in use, you will receive the message, "Cannot run Execu/Tech more than once for this workstation!" There are several reasons for this message. You've minimized the application and it's still running. The terminal number that your shortcut refers to may really be in use somewhere else. Your computer may have temporarily lost network connectivity, causing the application on your computer to hang but the server isn't aware that this happened. In this case, the server is still holding files locked for your computer and thinks your terminal is still logged in. In a Remote Desktop Services environment, your RDS settings may allow you to reconnect to a new session while the existing session is active. This is effectively running the application twice with the same terminal number and will produce the error message. If you are positive that you didn't minimize the application and that your terminal number is not in use anywhere else, you can use another terminal to check who the server thinks is using your terminal number. Click Help > About. 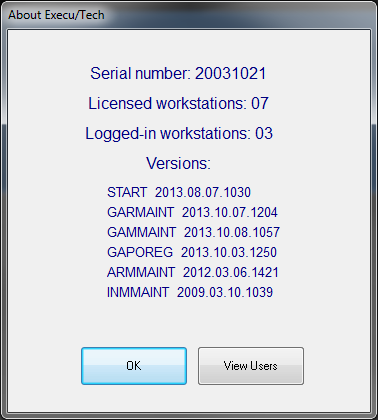 Versions of major application modules including START, GARMAINT, GAMMAINT, GAPOREG, ARMMAINT and INMAINT. Licensed workstations revers to concurrent logged in workstations. For example, if you have 10 licenses, you can install the software on 20 workstations, but only 10 will be able to run at the same time. This is useful if you have employees that have their own computers and work different hours. They could use a single license as long as they don't use the software at the same time. These computers should have unique terminals numbers to avoid the error discussed on this page. 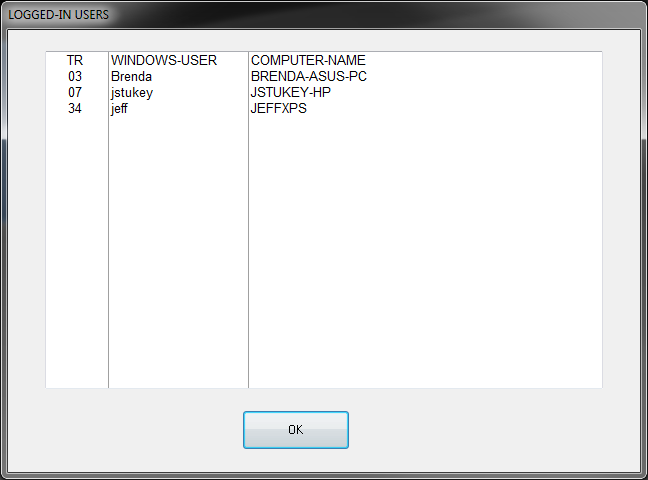 To view a list of the logged in users, click the View Users button. This will give you a list showing the terminal number (TR) , the Windows user name (WINDOWS-USER) and the Windows computer name (COMPUTER-NAME). If you see a computer listed here that you are positive is not logged in, restart that computer. Once that's done, close this window and open it again to refresh it. If you still see the computer listed there are a couple steps you can take to release the lock on the files. If this computer IS NOT using Remote Desktop Services (RDS) - From the server, in Computer Management > Shared Folders >Sessions, right click the problem computer and click Close Session. This should release all files that were locked by the computer. 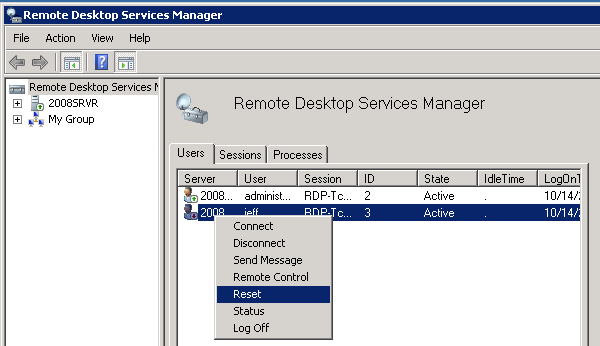 If this computer is using Remote Desktop Services (RDS) - From the server, in Remote Desktop Services Manager, in the Userstab, right click the problem user and click Reset. This should release all files that were locked by this Remote Desktop user.